The back roads, byways and country lanes of England are still dotted with pretty tiny villages full of storybook charm. But except in places like Suffolk, where picturesque villages are rather thick on the ground, you generally won't find them "on the way" to somewhere else. The fact that they have stayed off the beaten path is what keeps them small and interesting, and preserves their ancient yet timeless character. If you are planning an itinerary that will include a few pretty little villages with stops at village tea shops and pubs (and perhaps even an overnight stay at a pub) you need to plan your travels with a good map or road atlas. Your sat-nav or GPS device may be great at going directly from one destination to another, but the routes it suggests usually bypass all the good stuff. Instead, be willing to get off the main routes and travel the back roads. Ask at local tourist information centers and whenever you are given a choice of routes, choose the scenic ones. Don't expect to rush from one exquisitely photogenic village to another. English back roads are slow. Slow down with them and enjoy exploring at a gentler pace. And whatever you do, if you are talking to the locals, don't ever refer to these small towns and villages as "quaint." Local people find that word incredibly patronizing and nothing irritates them more. Here are some of the most interesting tiny villages to explore. 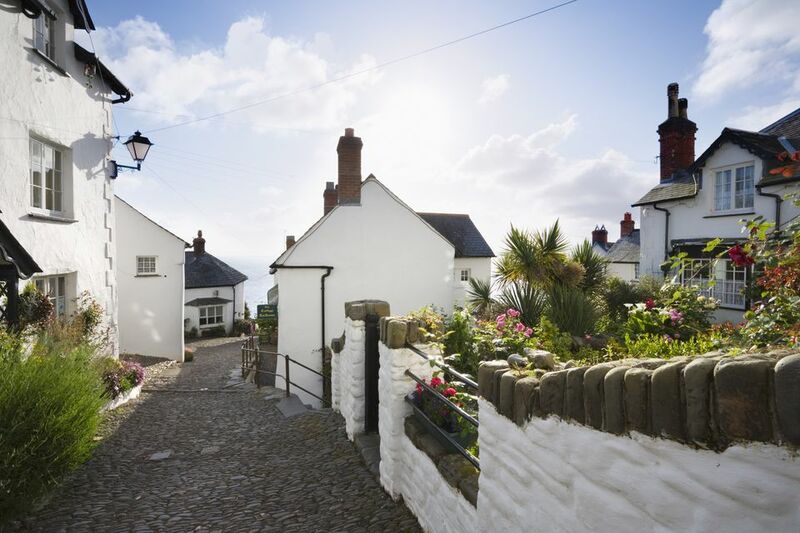 Clovelly's 83 pastel and white-washed cottages tumble 400 feet down a steep ravine to the sea on the North Devon coast. This privately-owned village of 300 people, was once a busy fishing port. The donkeys that today provide rides for children up and down its one cobbled street were once used to ferry boxes of herring from the little fishing harbor to the top of the town. Today only a few fishing boats still harvest a catch in the local waters. The town is recorded in the Domesday Book and at the time of William the Conqueror it was owned by the king. For the past 800 years, it has been held by just three families; most recently the Hamlyn family, who have owned Clovelly and surrounding lands since 1738. The village has one cobbled, pedestrian street which winds its way down to the working port at an angle of 20º. The best way to visit is to see the short film in the Visitor Center at the top of the hill and then stroll down to the harbor, stopping for tea or a bite to eat in the village inn or tea rooms. House numbering is quirky so if you are looking for a specific address it's a good idea to know that going down hill, on "Down along"—the cobbled street, numbers on the left side ascend and on the right side (called "Up along" but in actual fact the same street) descend. So the first house at the top of the street on the left has the lowest number and on the right the highest number. Clovelly is a real village where real people live, but because of its fragile position on the side of a cliff and its limited vehicle access, entrance is only permitted between 9 a.m. and 6:30 p.m., and then only on foot. An admission is charged to help pay for village upkeep. One Land Rover is kept at the bottom, near the harbor, so that people who have walked down but don't fancy the trek back up can book a ride to the parking at the top. Between Easter and October, disabled visitors can book the Land Rover at Visitor Center Reception to take them both up and down. Two museums are included in the village admission charge. The Kingsley Museum commemorates the life and work of Victorian writer Charles Kingsley, author of "The Water Babies" and "Westward Ho". The Fisherman's Cottage is the place to see how fishing families lived in the 1930s when Clovelly was still an important Devon fishing port. Harbor Activities Boats can be chartered for diving, angling and day trips. For a small fee, visitors can also try night fishing from Clovelly's ancient harbor wall. Movie Tourism - Clovelly harbor was the stand-in for Guernsey in the film adaptation of the New York Times Best Seller, The Guernsey Literary and Potato Peel Pie Society, due for release in May, 2017. If the Wiltshire village of Lacock looks familiar, that's because you've probably seen it before in films or on television. In recent times, this traditional English village of timber-framed, and golden Cotswold stone houses has appeared in Downton Abbey, the BBC’s Pride and Prejudice and Cranford; in Harry Potter and the Half-Blood Prince, Harry Potter and the Chamber of Secrets, Harry Potter and the Philosopher's Stone; and in the film Wolfman. Lacock Abbey also featured in The Other Boleyn Girl and its cloisters were used for Hogwarts classrooms. All of this, plus the fact that the National Trust looks after Lacock, makes it easy to forget that this is another one of those impossibly pretty, tiny English villages where people—a population of about 1,100—actually live and work. The village is about three miles from Chippenham, signposted from the A350. Although there is no visitor parking within the village, you can drive through it and there is pay and display visitor parking about 220 yards from the village. If you are touring the Cotswolds or planning a visit to the UNESCO World Heritage Sites of Bath, Avebury and Stonehenge, a visit to Lacock will fit right in. The village itself is wonderful to walk through. It's atmospheric and photogenic and there are several tea rooms, a hotel with a pub, and local shops worth exploring. All of that, save the small pay and display parking fee (free for members of the National Trust), is free. An admission fee covers entry to the nearly 800-year old Abbey and grounds—not a religious establishment but a home since the 1540s—and to the Fox Talbot Museum in the 16th century Tithe Barn. Of the original abbey, the medieval cloisters, a sacristy and chapter house remain. William Fox Talbot, who inherited Lacock Abbey, was pioneer in the early days of photography. He perfected the technique of preserving negative images so that photographs could be duplicated by being printed and fixed on photographic paper. The museum created in his home and in his honor features permanent and temporary exhibitions of early as well as modern photography. In 1973, film director Ridley Scott made a television and film advertisement for Hovis, a popular British brand of wholemeal bread. It featured Gold Hill, the steep central street of Shaftsbury in Dorset and its image of a boy on a bike delivering bread to a traditional English village has been an icon of nostalgia ever since. In fact, the British public voted it the 1973 film its favorite ad. Shaftsbury, a small market town, was founded about 1,000 years ago by King Alfred the Great, the most English of English kings, credited with actually creating England from a group of disparate Anglo Saxon, Celtic and Danish kingdoms. It is one of the oldest, and highest towns in England, with views that stretch across the area of Dorset author Thomas Hardy called Blackmore Vale. Hardy included descriptions of Shaftsbury in his "Wessex" novels, as the fictional town of "Shaston." The town is considered a gateway to the southwest and it fits easily into an itinerary that includes Stonehenge, Bath, Bristol and the Jurassic Coast. It's about 22 miles west of Salisbury on the A30. Walks: The open, hilly countryside around Shaftsbury is prime hill walking territory. But do keep in mind, these hills, that look gentle and rolling are actually high and long. After a weekend in the area, even dogs can have muscles too sore for climbing steps. Bring a walking stick. The Gold Hill Museum: This modern museum charts the course of local history from before Alfred the Great to the present day. Located at the top of Gold Hill, it occupies two ancient houses, one of them an old priests house with a peep-hole into the church. Shaftsbury Abbey Museum and Garden: The modern museum sits in a medieval herb garden and orchard, beside the ruins of a once magnificent Benedictine Abbey founded in 888 by King Alfred the Great. The museum relates the story of the Abbey, an Anglo Saxon nunnery, that flourished for 650 years before being destroyed by Henry VIII. The tiny Suffolk village of Kersey is little more than a crossroads and a few side streets, but with its thatch-roofed, pink-washed timber-framed houses, some dating from as early as the 13th century, this village of 350 is a magic place to stop. Go for lunch in the 14th-century village pub, the Bell Inn, built in 1378, and have a walk around after. It was once named one of the top 10 villages in Britain. Kersey was one of the early Suffolk wool towns that were among England's richest in the middle ages until cheaper, lighter fabric from the Netherlands wiped out their industry. Kersey was, in fact, a kind of woolen cloth but there is little evidence that it was made in this little town. The main street of the village crosses a ford (so you actually drive through a bit of river) beside a building that was once an old textile mill. There are a handful of pretty, thatched, self-catering cottages to stay in and the hill that climbs up to the village church offers wonderful views of the entire village. All sorts of legends swirl around the "chiding stone", a massive sandstone boulder that guards the entrance of Chiddingstone, Kent and, some say, gives the village its name. The stone was an ancient druid altar where judgments were pronounced. Ancient Britons conducted trials at the stone. This impressive, prehistoric formation was used as a Saxon boundary marker. Nagging wives and witches were punished, or "chided", by villagers in Medieval times. Walkers hiking in the Kent Weald often come across this natural pulpit, and it inevitably draws them to the village itself. It's not only the oldest and prettiest in Kent but, according the the Trust, it's also the most accurate surviving Tudor village in the whole country. Most of the timber-framed or brick buildings in the village are more than 200 years old and many are considerably older. The building that's now the post office is mentioned in local histories as early as 1453. The castle, used by the military in World War II, dates from the early 1500s. And the village itself, mentioned in the Domesday Book, was given to William the Conqueror's brother, Bishop Odo, in 1072. Today the village consists of one narrow street with cobbled sidewalks, several independent businesses along the high street, a church, a tea room, several residences, a castle and an independent pub and restaurant, the Castle Inn, that dates from 1420. If you are a fan of real ale, you should stop at the pub to sample Larkins, beers and ales made right around the corner—some with locally grown Kentish hops—about as local as it gets. And, naturally, as with so many National Trust sites, Chiddinstone has a long list of cinema credits including A Room With a View, The Wicked Lady and The Wind in the Willows.